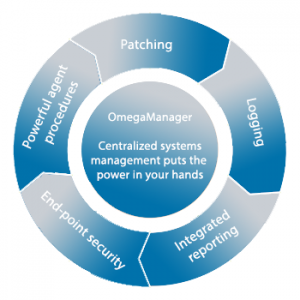 OmegaManager – single point for compliance control. Manage every PC and server on your network including dispersed locations. personnel infrastructures already in place. It puts you on an accelerated path to easily manage data security and PCI compliance, providing added controls at every level of your business. We will begin with a compliance gap analysis followed by implementation, integration, and deployment to address continuous compliance. You’ll be able to manage every PC and server on your network no matter how widely dispersed your locations are. After your initial deployment is complete, Omega provides your company with ongoing comprehensive training and support programs. Constant visibility – Spot potential breach incidents and stop them in their tracks. As soon as a problem is detected, the system implements automated remediation procedures to make sure it gets fixed quickly before any damage or data security compromises occur. Centralized logging – You can log activities across all stores in one centralized place, simplifying your audit preparations and proof of compliance procedures. Stronger network security – Protect your network by limiting access. You define who can access each area of your network and automatically receive alerts of unauthorized access attempts, helping to prevent data breaches and other security threats. Schedule a free consultation with Omega today. Call 636-557-7777 or email Security@OmegaSecure.com.